Our i-Loyalty system can operate in small to medium sized businesses and would be an ideal operational tool to generate more business. In a Restaurant business the loyalty system can work really well and can be used in all types of functions such as, discounts & incentives. The card can be used as a discount card, with money off scenario such as 5% for certain meal deals etc. 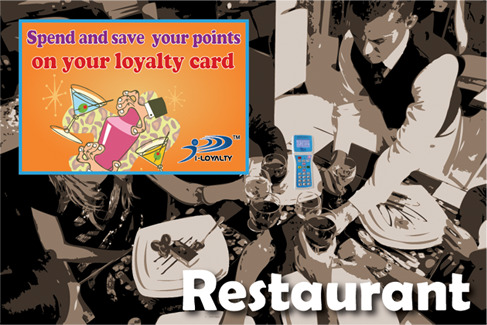 This can help to bring in returning diners or new diners to enjoy the benefits of the loyalty set up. Other incentives can include offers on various items such as wines and desserts. The frequency of visits can earn ‘free dining’ and money off certain meal courses or even day of the week offers, the list of incentives for the i-Loyalty is endless. i-Loyalty memberships are a great way to encourage customers to visit your establishment more frequently which will build and establish new and existing customer loyalty. 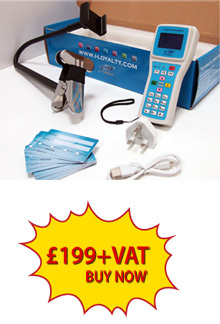 The hand held machine operates with such ease of use, and makes for a more fun way to promote offers or deals. The versatility of this can be a major factor when wanting to market and offer new deals, money off, discounts, free incentives. Loyalty rewards your customer relationship!